I hope you're day will be a great one. In this video you will see more products from Soap and Glory, Stila, As I Am, and more. I should have the text based post up tomorrow. This is the first video in my Curl That Fro series, where I will attempt to define my natural curls. In this video, I will review and provide a demo of a product named Boing, by Oyin Handmade. I know, I know, if I give one more speech about my absence on the blogging scene someone will want to flog me so I will spare you all.....so let's get on with all things BEAUTY. When I noticed that Sephora started selling their Sephora by OPI polishes for a reduced price, I knew they were cleaning house but I didn't realize they would try to tap into the nail polish market by taking complete ownership and creating their own line of polishes. 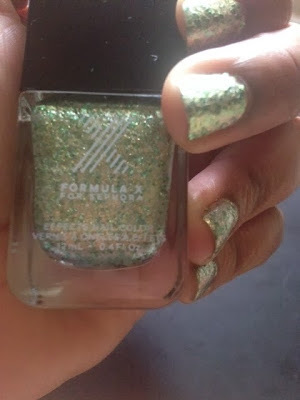 Sephora recently launched Formula X, it sounds like a top secret, mission impossible type of polish, but I thought whatever.....different bottle same old polishes. Well let me shut my mouth because Sephora came back with a kick. I first saw the full display last week and I thought cute but who cares, until I decided this week to take a closer look at their effects polishes. OMG. Of course they came out with standard colors, and a wide range of colors at that, but what stopped me dead in my tracks is their effects collection. Their effects polishes have been broken down into 13 categories, most featuring 12 or 5 variations of each effect. You can find a complete list of the effects here but I decided to start by testing out the Sparklers division. I purchased both Drawn To You ( a champagne base with green 3D glitter) and Law Of Attraction ( a champagne base with 3D blue glitter). Don't take my word for it, go to Sephora and sample a little of the polish on your nail before purchasing...use the tester bottle of course..lol. The brilliant shiny champagne base coat was beautiful enough to capture my attention but the magnificent glittery specs of different sizes sealed the deal. Like any textured or glitter polish, I knew it would be annoying to remove but it was so pretty I just couldn't help myself. The modicum of self control that I tried to exhibit on that day was the only reason that I didn't leave with all of the Sparklers. You know what this polish doesn't need? 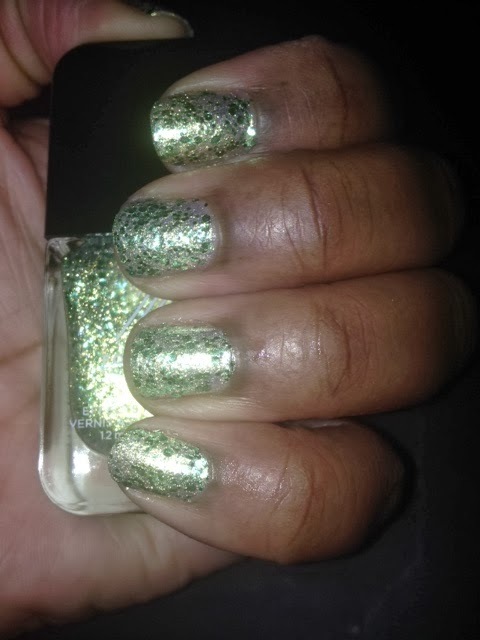 A TOP COAT, I don't mean to cyber scream but this polish is great. I know I just applied it last night but I don't see a chip in sight and it's still shining brilliantly. The last picture was taken without flash to allow you to see this sparkly goodness all on its own. Most of the polishes from this line cost $12.50 but you can get the base coat and other supplementary polishes for $10.50. And to top it all off, the polishes are indeed PARABEN FREE, in fact it is a 3 free polish.....did you squeal with excitement too? 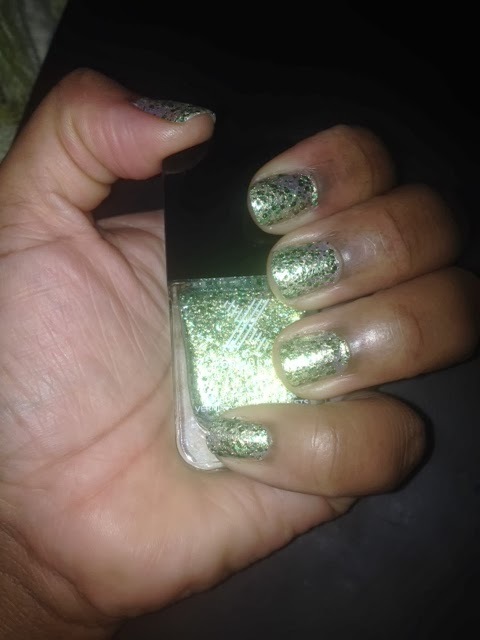 I happen to be waiting on pins and needles for a 5 free polish that will soon hit the market from a fellow blogger Mischo Beauty, but until then I will bask in the glow of my Formula X Sparkers polish. 1)Not all store bands stink, well Target really taught me that lesson but it was reaffirmed through Formula X! 2)If you plan on teaming up with Sephora to create a product, Sephora may decide to drop you and destroy the competition...note to OPI. I see that Sephora took a few cues from other polish brands and simply rolled it all into their Formula X collection. They have polishes that are holographic, 3D, sparkly, chrome finishes, jelly, lusters, and a bunch more. UPDATE- I washed my hair tonight and chipping ensued...I guess a top coat would have helped., however, I still like this polish. Have you purchased any of these beauties?